Students entering UC Santa Cruz complete an assessment using on online tool that results in better math placement. Better math placement means students matriculate faster, helping them graduate on time. A pilot program in online adaptive learning at UC Santa Cruz has led to higher placement in math courses for newly admitted freshman students—and a commitment to instruct students in math in ways that adapt to their own proficiencies. Of the more than 722 entering students who completed math placement via online assessment during the summer of 2015 and made use of adaptive learning software to review and reassess, 84 percent showed marked improvement that enabled them to qualify for higher math courses. Many students who had placed into College Algebra (Math 2), for example, were placed into Pre-Calculus (Math 3) or Calculus after working through online adaptive instruction. Others who had initially placed into more advanced courses than College Algebra also improved their placement, enabling them to make more rapid progress toward their academic goals. All of this was accomplished without worsening overall pass rates in these courses. Last summer, even more UC Santa Cruz students improved their math placement: 88 percent of the 731 students who reviewed and reassessed qualified for more advanced math courses. 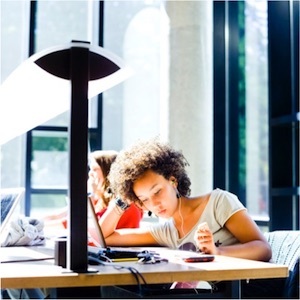 UC Santa Cruz’s new placement process uses McGraw-Hill’s Assessment and LEarning in Knowledge Spaces (ALEKS) math placement system. This artificially intelligent assessment and learning system addresses college preparedness, course performance, and retention with its Placement, Preparation, and Learning (ALEKS PPL) platform. Using adaptive technology, ALEKS provides personalized learning in basic math through calculus to help students qualify to take more advanced courses. “When students arrive on campus better prepared in math, they have a better chance of making good progress toward their degree and graduating on time,” says Jaye Padgett, Interim Vice Provost for Student Success. How does ALEKS PPL work? ALEKS is an interactive, web-based system that uses adaptive questioning to quickly and accurately estimate the student’s mathematical knowledge. ALEKS then offers instruction on the topics the student is most ready to learn; as the student progresses, ALEKS makes periodic reassessments to ensure the material is mastered and retained. ALEKS was developed at UC Irvine in 1994 with support from a National Science Foundation grant, and in 2007, ALEKS Corporation was approached by the University of Illinois at Urbana-Champaign, which had concerns about its students entering Calculus I without prerequisite skills. The mathematics department piloted the ALEKS Prep for Calculus for course placement and found a relationship between the scores on the ALEKS assessments and course outcomes. For now, the goal is to use ALEKS PPL to reduce the number of students needing College Algebra and Pre-calculus without jeopardizing those students’ success in math, to expedite the time it takes students to graduate, and to improve retention and graduation rates, particularly for those in science, technology, engineering, and mathematics (STEM) fields.